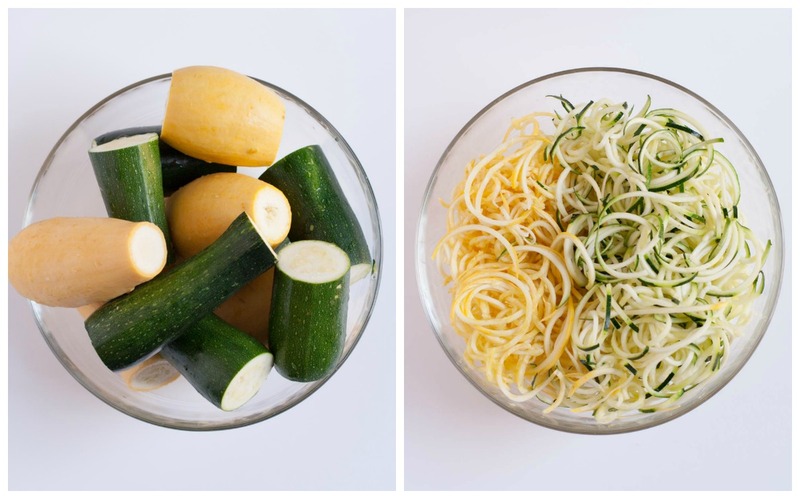 When spiralizing, you choose a blade size to achieve the thickness of the noodles for your dish. I used the medium sized blade. 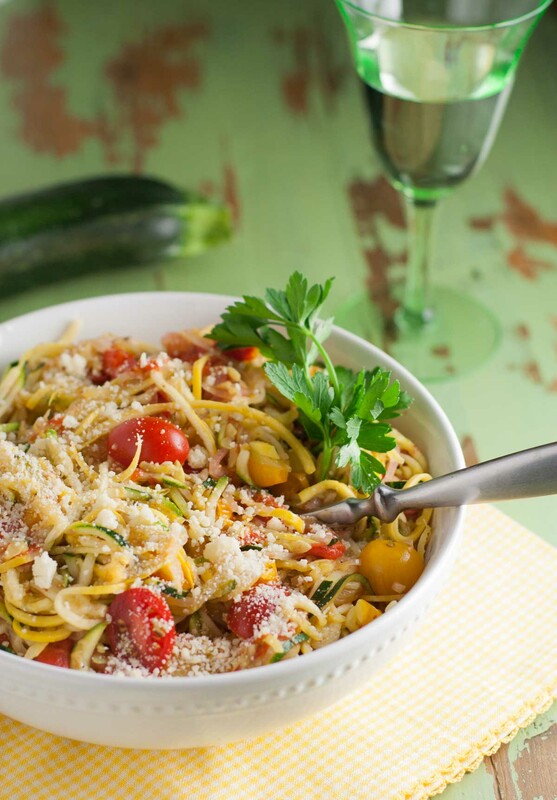 After you read this recipe for Zucchini Noodles with White Wine Sauce, I hope you add some sort of spiralizing “contraption” to your holiday wish list. I ordered my Paderno from Amazon. You’ll be thrilled, although your family may begin to resent any food with a curly shape…even fries! But until then, spiralize everything in sight! 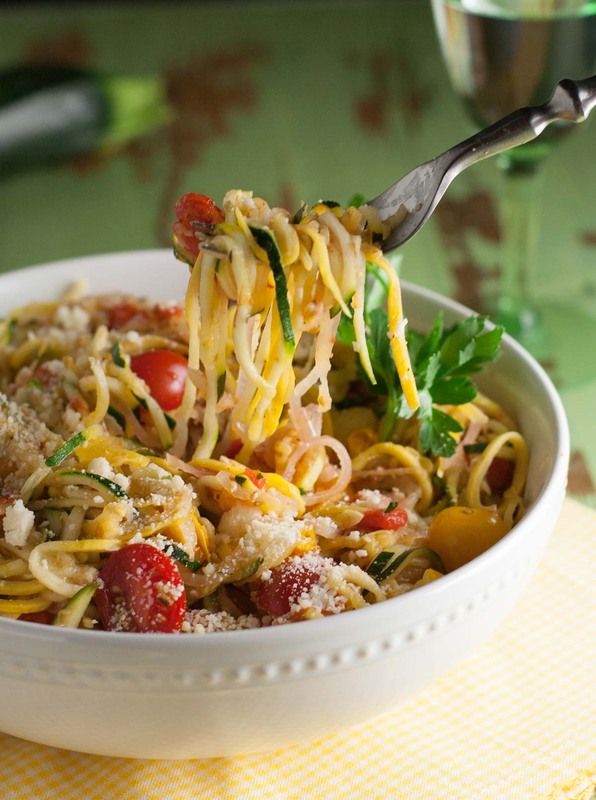 A good resource for all things spiralized is Ali Maffucci’s blog and cookbook, Insprialized. I bought her cookbook which is loaded with great ideas and would make a great gift this holiday season. First of all, I decided to spiralize both zucchini and squash. Together they make a beautiful and healthy combination. Since I wanted to add some sautéed onion, I thought, “Why not?” So I spiralized the onion too…believe me, you’ll understand more once you get your hands on this little machine! When you choose the vegetables to spiralize, the thicker, the larger, the better. 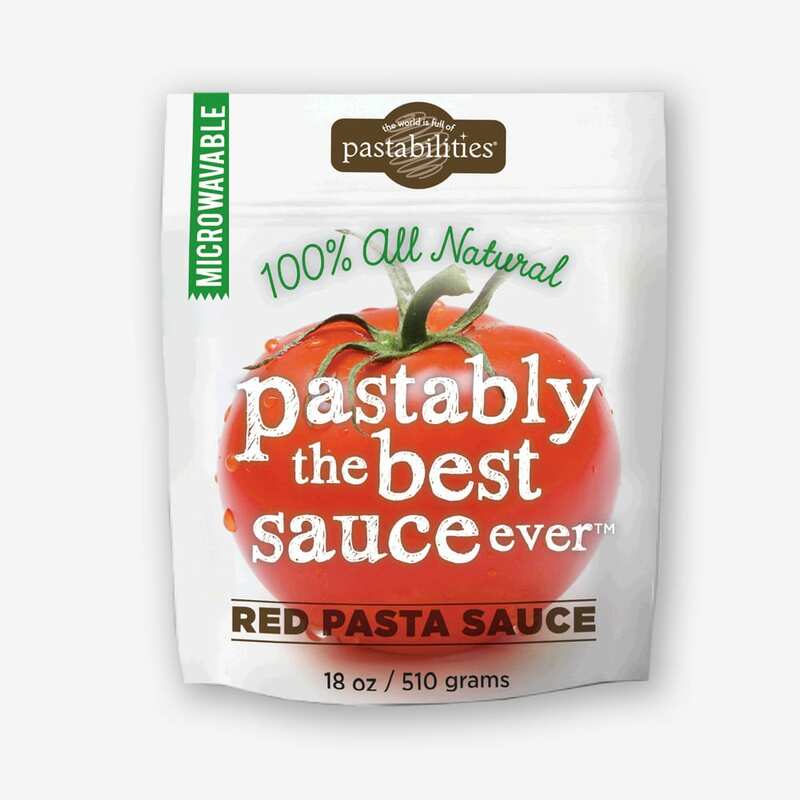 The larger veggies make their way through the blades easier and make for longer noodles. In fact, some of my noodles were so long, that I decided to cut them in half. Wait a minute, you‘ve done that before. Breaking up the spaghetti noodles before throwing them in the boiling water?! When you are the cook, and in your kitchen (headquarters), you can do whatever you want. Amen! Once your veggies are spiralized, you just pan sauté them for a few minutes with some onion and seasonings, add some wine and butter, and Voila! You have just created a fabulous healthy main course….or a wonderful side dish to seared steaks, grilled chicken, pan sautéed fish, etc. 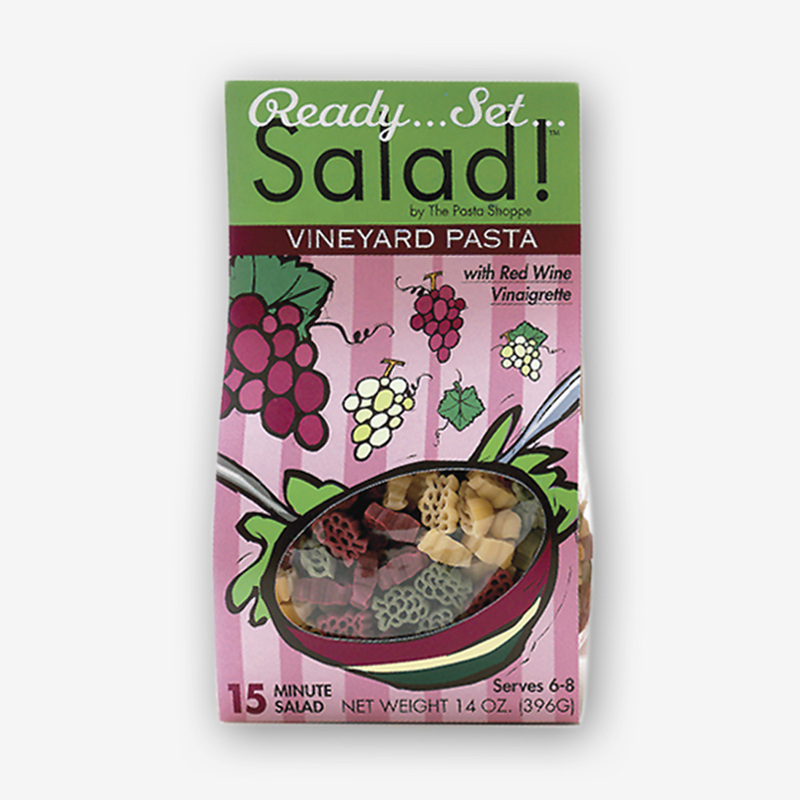 The colors, the curls, and the texture will add exactly what you need to brighten up your plate. Not to mention this dish is low cal, low carb, and gluten free! 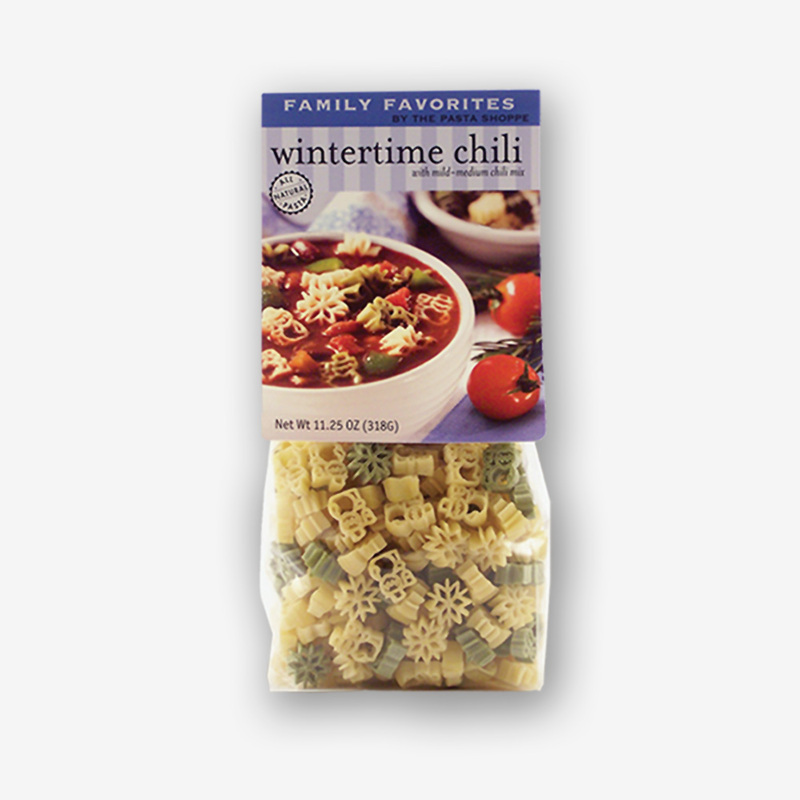 Honestly, I welcome these new veggie noodles into the noodle family and hope to share more ways to enjoy them! 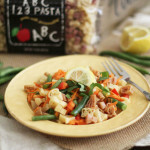 Next on my list to try is Zoodle Pasta Pie, from Marie’s Proud Italian Cook blog. I’ll let you know how it turns out. Looks fab! Until then, Spiralize-On my friends! And please share any noodle recipes as you do! 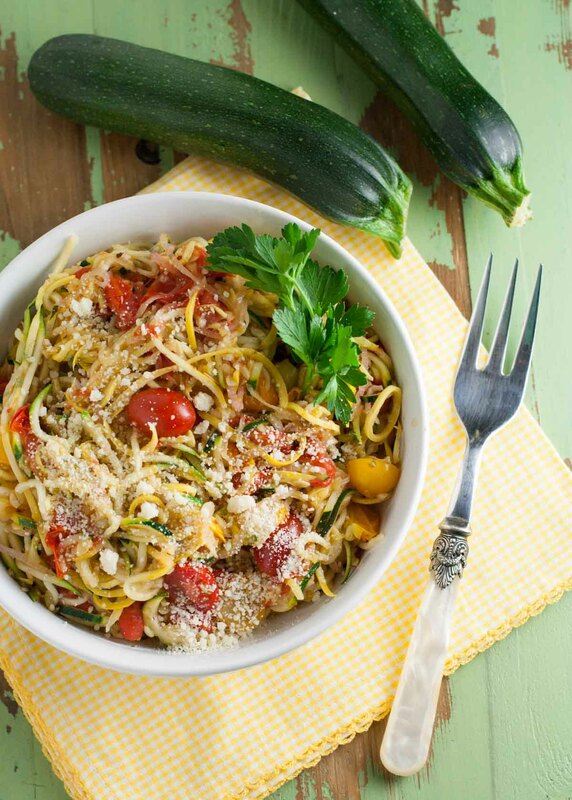 Zucchini and Squash noodles are a delicious and colorful healthy dish! And they taste like real noodles! Heat large saute pan to medium high heat. Add oil. Saute grape tomatoes and onion for 3-4 minutes, until onion is translucent. Add garlic and saute another minute. Add white wine and stir. Add zucchini and squash. Using tongs, toss and saute noodles for 2-3 minutes. You want your noodles to be al dente! Add butter, Parmesan, and parsley. Toss. Add salt and pepper to taste. You'll notice that the zucchini and squash give off a lot of water. Drain excess water from pan. 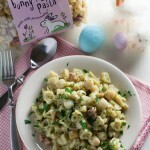 Top with additional Parmesan and parsley! The quantities of zucchini, squash and tomatoes can vary! Use what you have and what you like! this looks so light, colorful, and delicious. Hope to try it soon. Yum! I love that it is gluten free! 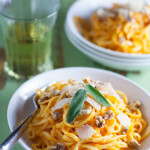 Maybe ZucchiniNoodles will “squash” their competitor: spaghetti squash ! 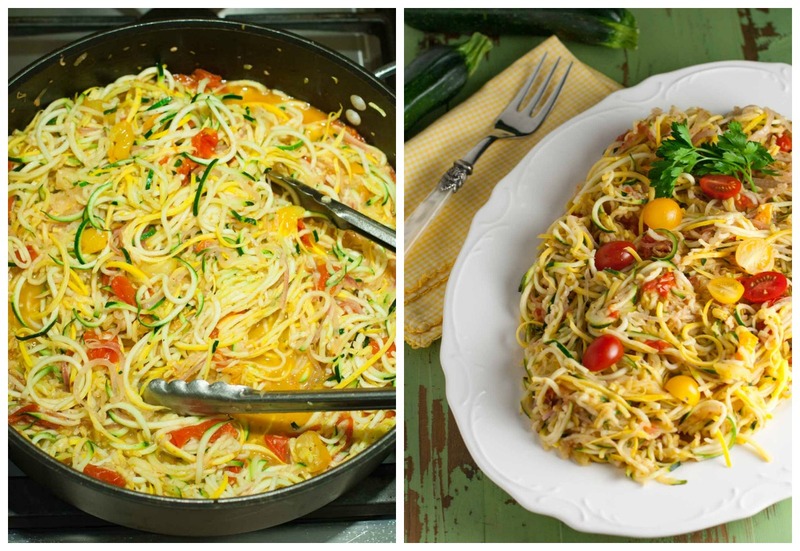 Zucchini noodles are way better than spaghetti squash as a matter of fact I personally think spaghetti squash is horrible. Zucchini and yellow squash imo are amazing. This is great for when I entertain my vegetarian friends. They’ll love this! This looks delicious! I have been wanting one of those machines that cut noodles out of your veggies. And I would love to try this recipe! Thank you! This looks and sounds delicious. I can’t wait to try it. This is so pretty. I love zucchini and this looks like a flavorful dish. I wish I had a spiralizer. This looks good, something I really want to try! I LOVE the fact this is low carb!! I’m a diabetic and have to watch my carbs closely. This looks yummy. 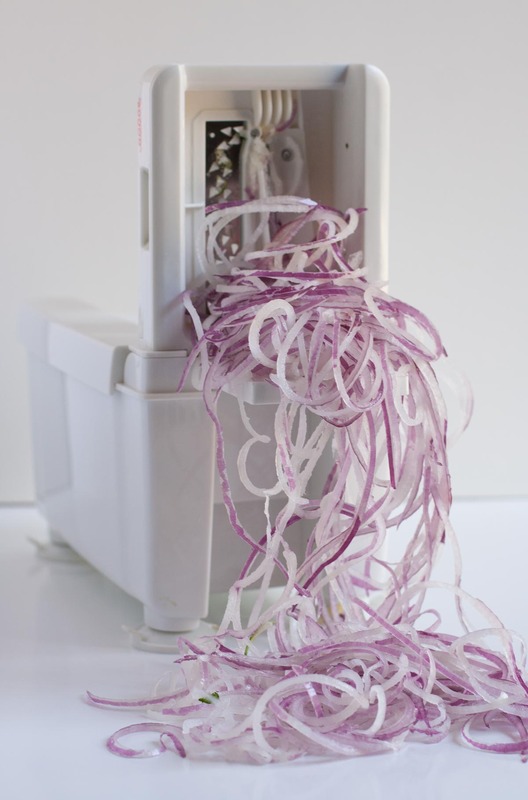 Appreciate the spiralizer and cookbook suggestions…I now see this is more than a fad! I’m ready to get on the spiralize wagon too! Really enjoyed this. I didn’t have cherry tomatoes and so I used 1/2 of a beautiful organic tomato I had instead. I also skipped the fresh parsley since I didn’t have any. We thought it was really delicious even with those substitutions and omissions and I will make it again. Thanks! So glad you liked it! Great idea on the organic tomatoes…appreciate you letting me know! 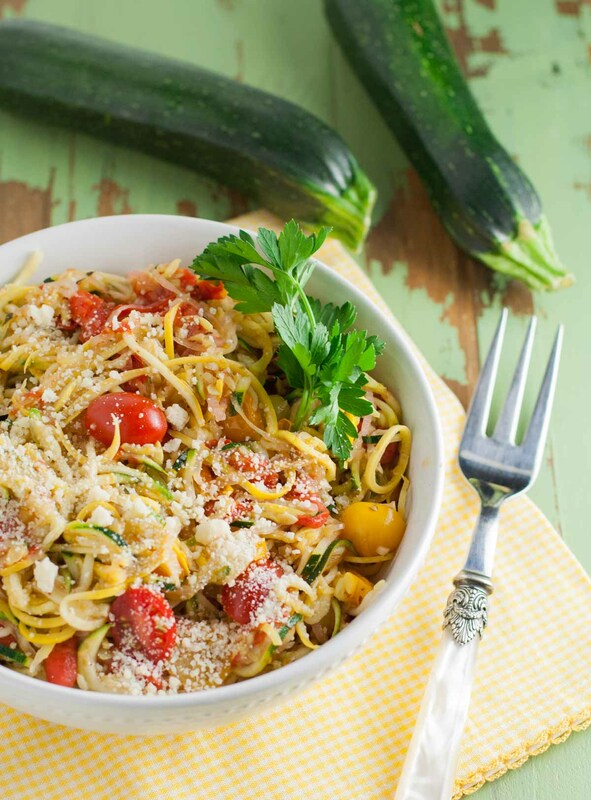 Stay tuned soon for some more zucchini noodle recipes! 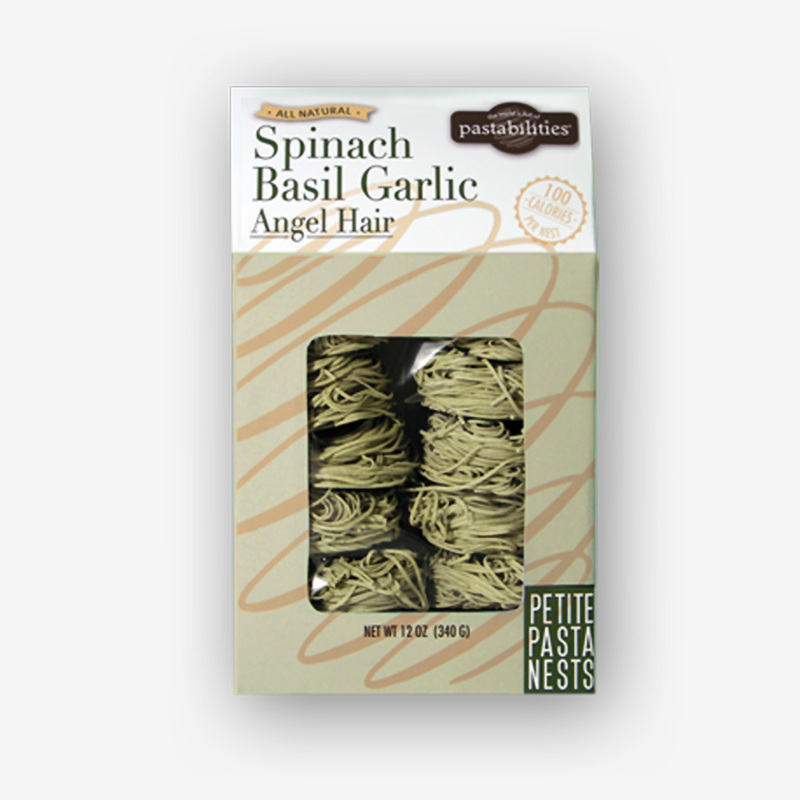 We love to spiralize, too! This is so tasty!